MCA is an international player in engineering and high-tech consulting. Powered by Engineers ! 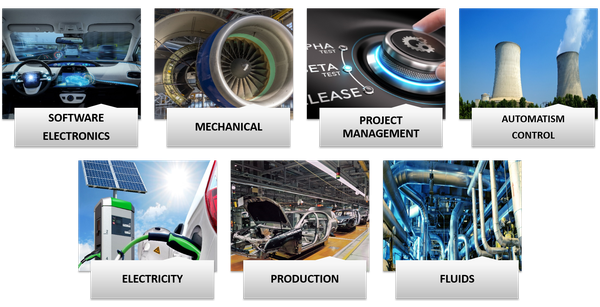 MCA is an international player in engineering and high-tech consulting. The group’s expertise and experience in a variety of sectors make it a recognized partner of the biggest industrial companies. More than 1450 engineers in France and abroad work for MCA, offering technical assistance in service centers or under fixed-rate contracts. MCA’s consultants are engineers commissioned for strategic and technical projects in some of the biggest companies in the industrial and tertiary fields. We support our clients with their innovation and R&D issues during the entire product life cycle. In 2018, MCA was rewarded "Company of the year" in France at the European Business Awards ! 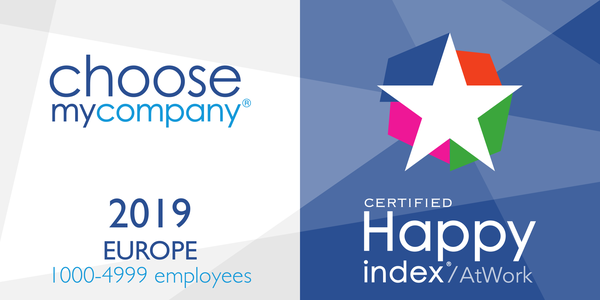 and for the second time, MCA was awarded Happy At Work in Europe ! In order to ensure sustainability, MCA is investing in new areas and activities such as service centers. The main source of investment is MCA’s own profitability. Thus, our financial strength allows us to collaborate with the biggest European contractors. MCA is investing in them, consequently generating new opportunities and possibilities for the career development of our employees. Thanks to its rigorous management, MCA is a high-performance company which is investing in major future projects. From the very beginning, MCA has completed projects to the highest standards of quality. Extensive assessments are frequently carried out to ensure the improvement and effectiveness of our policies. MCA depends on the excellence and ethics of its teams to make internal and external relationships more transparent and to resolve problems as quickly as possible. Moreover, MCA has been certified ISO 9001 since 2003 and OHSAS 18001 since 2014. 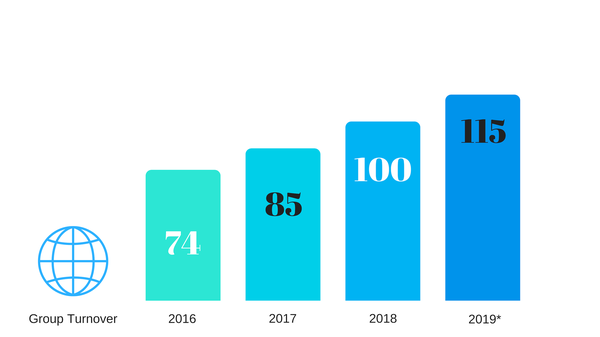 We are engaged in the UN Global Compact since 2014. 2013: Creation of 3 subsidiaries in Sweden, Germany, the Netherlands. 2006-2009: New agencies opening in France in Aix-en-Provence, Lille, Lyon and Nantes. Creation of MCA Benelux. These major issues force industrial companies to find new solutions, and MCA has been using its expertise to support its clients with their innovations for more than 20 years. MCA has been referenced by the main organizations in the railway sector. We are able to suggest engineering solutions for each project step thanks to our knowledge and competencies in this field. MCA is an international company which supports the entire life cycle of product development in several markets around the world. Joining us means joining a dynamic and welcoming Group in full effervescence. You will have the opportunity to work on technological and challenging projects for prestigious clients. MCA has obtained Happy at Work 2019 certification! HappyAtWork is the first participatory employer label that rewards excellence in employee management and motivation. MCA’s strategy is to develop its employees’ competencies, and this implies an active and understanding Human Resources policy. Thanks to its investment on many business sectors and on many areas all around the world, MCA opens up lots of opportunities for professional and personal development, both in France and abroad. To join MCA means to revitalize your career, and to get quick opportunities to develop yourself as well as a sectorial diversity. MCA is recruiting long-term contracted consultants graduated from top engineering schools, with strong technical knowledge and professional expertise. Since our clients are mainly key-accounts, attitude is as important as knowledge. More than technical competencies, MCA is looking for positive personalities, open-minded ones, with great adaptability and strong natural curiosity. 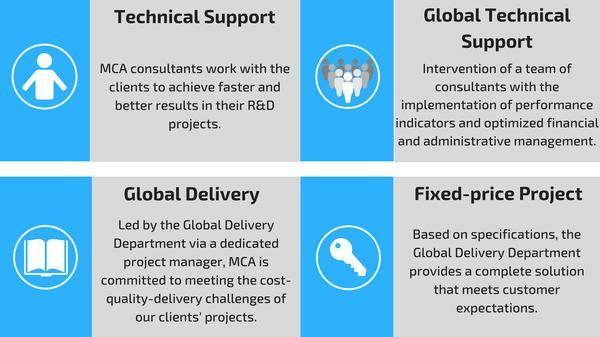 Consultants are in daily contact with strategic positions; they act as MCA’s ambassadors to our clients. One of MCA’s strengths is the quality of our follow-up. We always make sure our managers and our consultants have the best relationship to be able to work closely. During any mission, some regular update meetings are scheduled to discuss the current projects, whatever the consultants are working on our clients’ sites or on MCA’s headquarter. The main objective of those is to ensure the collaboration is efficient, to anticipate the activity and to guide the consultants’ development. MCA always tries to adapt itself to the consultants’ wishes regarding the area and the position. Moreover, few events are planned several times a year, with managers and consultants from different business sectors to promote internal cohesion and sharing experiences. An event with MCA’s top management, managers and all the consultants is also planned every year.  On a daily basis, consultants are followed-up by their manager, with the help of our Human Resources teams. MCA is supporting its engineers’ technical development and is always trying to match the best their competencies with their career path. The candidates we are recruiting are directly working on a position matching their competencies and experiences. To support them in their development, MCA is offering to all its consultants some training fitting their career path. On a long-term basis, engineers who are working for MCA gain critical knowledge. Our company is identifying its consultants’ cross-functional competencies to make them work for our key-accounts on different business sectors. 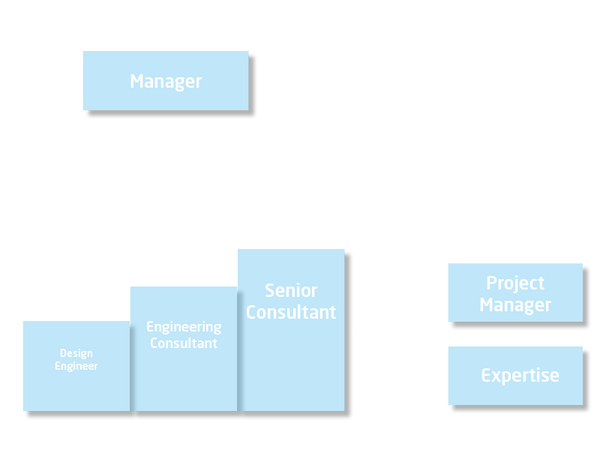 Consultants benefit from gateways between one market and another to choose the position that fits them. The increases of their knowledge as well as their competencies diversification remain as strong assets for their career path. MCA’s managers work on core activities within the company. Thanks to both their managerial and business competencies, they are able to manage their profit center, quickly develop their skills, and can choose to work in France or abroad. Their role in the company is to create and develop their client portfolios, determine business strategy and foster key account loyalty. Apart from that, they are responsible for building their own team by recruiting consultants in order to meet their clients’ needs. MCA offers its managers the opportunity to work in diversified fields in order to consolidate their industrial knowledge. By joining MCA, they gain new industrial engineering expertise in different areas and maximize their development potential. MCA is recruiting long-term contracted managers who have graduated from top business or engineering schools and who have relevant work experience in a business and/or engineering environment. They work daily with the main decision-makers of major industrial companies and lead their own consulting team. These responsibilities require an exemplary performance. MCA is looking for results-oriented collaborators with a strong entrepreneurial spirit. 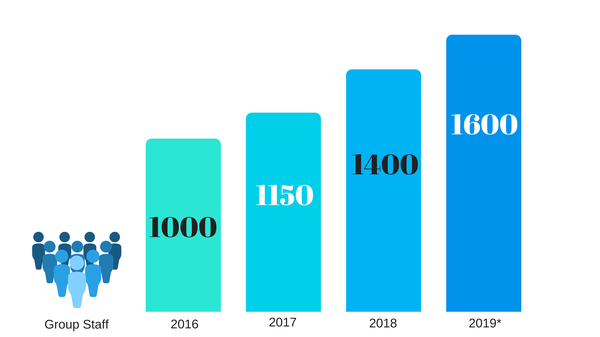 Thanks to increasing growth, MCA is continuously looking for new talent. The manager recruitment process generally starts with an initial telephone call. Then, interviews are scheduled. All of our managers are contracted on a long-term basis. From the moment they arrive, MCA managers benefit from training in all business engineering activities. Our MIP training (Management Impulse Program) lasts three weeks and provides a complete overview of the business and managerial aspects of the position. Every year, MCA plans a seminar with all the company managers to promote internal cohesion and share experiences. An event with MCA’s top management, managers and all consultants is also planned each year. Also, to consolidate the relationship between our managers and their consultants, social events and activities are planned several times a year with employees from several business sectors. These events foster relationships between our managers and the other teams that form part of MCA. Managers actively participate in their own development. They are evaluated on both their managerial and business competencies. Their performance and their maturity encourage self-development and the possibility to reach higher levels of responsibility. On a long-term basis, managers who work for MCA gain critical knowledge and develop a high-quality network of contacts. Ready to find success with us? Become a manager for MCA! Our support activities assist and coordinate the operational work on a day-to-day basis to help the company to grow. Our staff work together transversally across MCA’s diverse divisions in order to carry out the company’s strategy successfully. By joining MCA, staff gain new global industrial engineering knowledge and maximize their development potential. MCA is recruiting dynamic, motivated and teamwork-oriented individuals with all levels of experience. MCA’s employees are contracted on a long-term basis and have the opportunity to work in France or abroad, depending on the positions available. MCA promotes internal employee mobility as well as personal development. Apart from annual evaluations, our human resources team is dedicated to providing daily support and assistance to staff working in support activities. 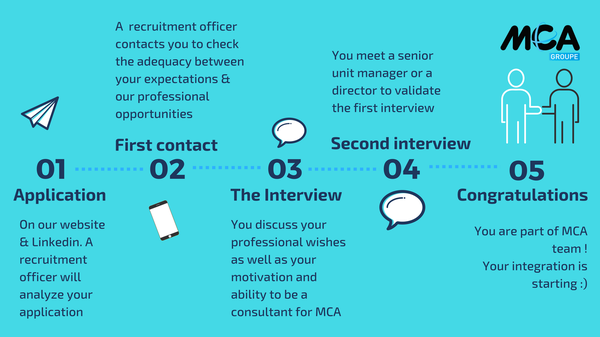 Self-development through internal mobility within a dynamic and professional environment is one of the strengths that MCA offers its staff. Do you want to take part in the development and success of a dynamic company in France and abroad? Join MCA! Hello Antonella, could you introduce yourself shortly ? I am Antonella and I’m from a small town in southern Italy. I graduated at the master’s program in Mechanical Engineering at Università della Calabria, in Cosenza. After my graduation, I started to look around and MCA caught my attention. It gave me the idea of a young company with a strong will to grow, as much as I did. Can you tell us about the project you are currently working on at FPT? I am currently working at FPT as a Vehicle Testing Engineer. I deal with the phases that drive the free market customers from the technical specifications of the engine that best suits their particular application, to run the tests necessary for the release of the application once the engine is correctly installed on the vehicle so that everything is in line with FPT specifications. I also take care of solving unexpected problems that may arise during the engine life, and this is the most fun part. What do you enjoy most about this project, and what have you learned so far? Studying at university allows you to discover the theory behind everything, which is a great chance because it opens your mind but sometimes with the risk of starting to loose practice. Right after my graduation I felt the need to be on the field and this job is perfect for this purpose. Moreover, the applications are always different from each other so every time there are so many new things to learn. Any advices for someone who would like to do the same career? Be curious, be humble. Keep a positive attitude towards what you do not know because you are about to learn something new and it’s an opportunity not to be missed. Would you see yourself continue working in the automotive field or would you like to change at some point? I have just started this job and I like what I do; these two reasons do not lead me to think about a change right now but I am a dynamic person and I do not exclude the possibility of changing one day. What do you prefer about working with MCA? The opportunity to share work experiences with the other colleagues that work in MCA for other companies and the unquestioned support of MCA managers. If you had to describe MCA in 3 words what would they be? Young, careful and, to stay on topic, I would also say propulsive. If I'm in the office I usually start working at 8 in the morning and I start doing the activities planned for that day. Otherwise, if I work outside the office and at the clients sites the working day changes every time according to the tests that have to be performed or to the problems encountered. What would be the next step for you, career wise? Improving day after day, becoming everyday more independent and probably one day moving to another country. In your opinion, what is the best thing about working in Turin? What activities you’d recommend to someone who wants to come for a weekend? The best thing about working in Turin is that there’s always something interesting to do and since I love going to the concerts and to the theater Turin suits me perfectly. Of course it’s a beautiful city and there’s a lot to visit but since I moved here my favorite place to visit during the weekends is the Langhe, one of Italy’s top wine producing regions which is really near to Turin. So if you love good food, wine, vineyard covered hills topped with castles and pretty towns I would absolutely recommend to visit it. I am pretty reckless. I really enjoy adrenaline-rush activities like paragliding, canyoning, zip-lining, etc but since I grew up in a seaside town I have never measured myself with snow sports and now that I live in Turin I'll at least have to learn how to ski sooner or later !